For industrial production of balls and long, dimensionally stable, skinless products of varying cross-sections. Handtmann's FS 520 rotating hole forming solution fully automates production of formed products in a wide variety of 3-D shapes and sizes in multi-lane configurations with high cycle times at 250 cuts/minute. Easy changeovers as real-time on-screen graphic product visualization shows the shape as its forming while process parameters are being input or called from system memory. 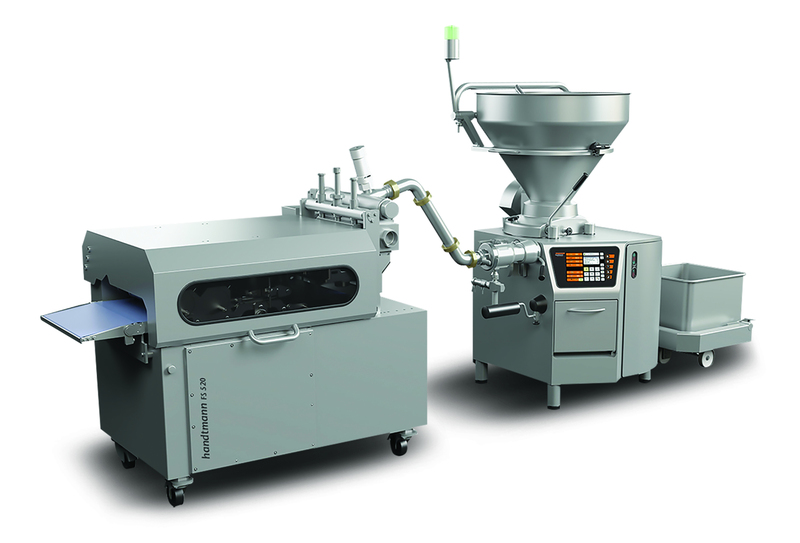 The VF 800 vacuum filler and flow divider provide continuous servo-driven product feed without pressure fluctuations to the servo-controlled FS 520 3-blade system to create well-formed shapes with weight accuracy across all lanes. Extend your range of modern, contemporary product ideas for today’s consumers, with Handtmann’s reliable, fully automated formed products solution. Maximum cost-effectiveness and gentle treatment guarantees first-class product quality.